Download Happy Hour Roll Up Standee Design PSD. This Happy Hour Roll Up Standee Design which is suitable for any beer bar, alcohol pub, restaurants and even for event related businesses. 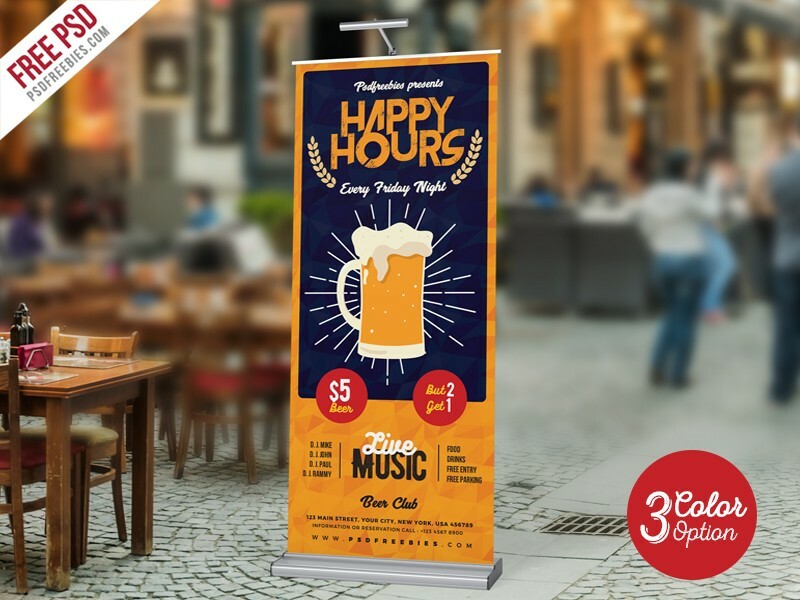 You can also use this Happy Hour Roll Up Standee Design PSD to showcase or promote happy hours and best offers to increasing your sales. This Free Roll up standee design is available in 3 different color variations which you can choose and customise according to your choice. So download this Free Happy Hour Roll Up Standee Design Template and you will get 3 psd files in 30in x 70 in dimensions, it is design in 200 dpi and CMYK Print ready PSD file Format.All main graphic elements are editable and you can easily edit the text based on your event requirements. Hope you like it. Enjoy!